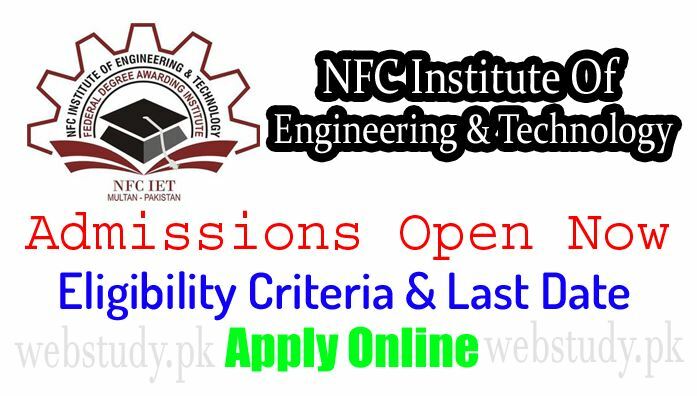 NFC Institute of Engineering & Technology Multan admission 2019 are now open for all the undergraduate, postgraduate, Mphil and PhD programs that they offers. 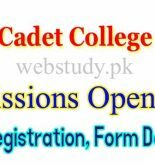 Here at webstudy.pk you can get complete details of NFC IET University Multan admission 2019 last date, form submission, entry test, merit list, scholarships and NFC Multan Fee Structure. You will be guide completely that how to download online form and how to fill the form correctely and where to submit the NFC Multan admission 2019. NFC Engineering & Technology Institute Multan offers admission in two departments ie chemical department and electrical departments. NFC University multan admission last date is mentioned on advertisement along with eligibility criteria and other details. NFC institute of engineering and technology Multan is famous engineering university in Pakistan and recognized as world class university in Pakistan that is providing the quality education to the students under all the basic facilities. NFC made their name in the list of top universities ranking by HEC and PEC due to its hard work and dedication. NFC University Multan Campus provide airy class rooms, air conditioned labs, library, canteen, common rooms, transportation, highly trained staff and well educated faculty. Here all the students can get admission in their interested departments ie B.Sc Engineering in Chemical, Electrical, Mechanical and Civil, BSCS, BS Environmental Science, Bachelor of Architecture, BBA, BSc City & Regional Planning, BS Food Science, B.Sc Engineering Technology in Chemical, Electrical, Mechanical and Civil. Important dates, admission schedule and other details can be obtained from here. There on prospectus you can find the eligibility criteria for all the programs but you can also read them here. A candidate must have score 60% in F.Sc/DAE/ICS to get admission in bsc engineering. Moreover candidate should score 100 marks in entry test conduct by NFC IET. Candidates must have done Computer Science with chemistry in f.Sc or A Level or ICS students are also eligible to apply for admission in Electronics engineering. Applicant should have done intermediate F.Sc engineering/ DAE with computer science/general science/commerce with minimum 45% aggregate. You have to buy a prospectus from university campus and in prospectus you can find the application forms of BSCS, BS Architecture, BSES and BBA programs. You have to fill the form correctly and pay the admission processing fee to university bank account and have to attach the bank challan copy with application form. After that attach all the required documents along with the admission form and send it to the admission office. You must have to pay Rs 1000 in the form of bank draft minimum 1 week before the entry test and that is entry test fee. You can purchase the prospectus from university campus on the payment of Rs. 2000/- or sending through Bank Draft in the favour of NFC Multan. Both male and female can apply for admission in NFC University undergraduate programs and university is inviting applications from all over the Pakistan. Interested candidates can apply for admission through legal way and can get admission in university through proper way. Here at webstudy.pk you read all the information about how to apply for admission in NFC university multan and we are sure that if you are going to apply then you will face no difficulty because we have discussed all the information in details for you. Note that all this information about NFC Multan Admission 2019 is collected from different online sources but for authentic news & updates of NFC University Multan Undergraduate admission 2019 last date visit official website.